I’ve finished another workflow, and this one is a bit special. Post links to Pocket directly from Alfred. You can download it here and the code is on github , feel free to submit pull requests. First login with pocket using “pocket_login” command, this will take you to the pocket site to atuhenticate. 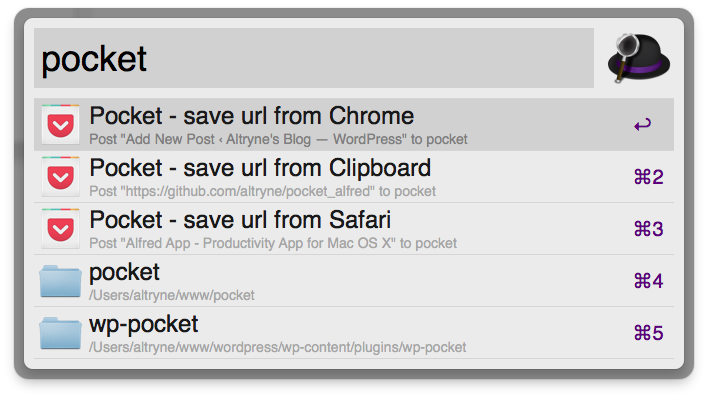 Then use “pocket” keyword, to post urls from Chrome/Safari/Clipboard straight to pocket. There were already some nice pocket workflows, but they all required either the official Pocket.app for mac or another form of username/password authentication. I didn’t really wanted to store my Pocket passwords, so I created this workflow using Pocket API and oAuth. Doing oAuth with Alfred is a bit tricky. But manageable. When user writes “pocket_login”, a ruby script runs via script filter, which requests the initial token from pocket. Now I know this may seem a little hacky, but it works perfectly, and the server even has a timeout, so it won’t run forever and to minimize security risks. The code was written in ruby, as I found out that it’s the simplest language to allow me to run a webserver from the command line without additional gems/packages what have you (php didn’t work for some reason :/). And I must admit, the code is quite messy, because I’m a ruby noob and I was learning as I go.